NJ Transit plans to shut down the Atlantic City Rail Line in September through the end of the year, and possibly longer. The news, first reported by the Bergen Record after it obtained an internal email, was confirmed Friday in a news release from the transit agency. Service will be suspended on Sept. 4, according to NJ Transit. The train should start running again in early 2019. Train service will be replaced by buses throughout the suspension period. The route, which runs 12 times a day on most days between Philadelphia's 30th Street Station and Atlantic City, carries about 1,850 riders a day, according to NJ Transit's annual report. It's been a long, slow decline for a rail route that once was the cornerstone of Atlantic City's prosperity. When the Camden and Atlantic Railroad Company received a charter to build a railroad in 1852, it created an easy connection between Philadelphians and the Shore. It has become one of NJ Transit's least-used lines, and has been bleeding ridership for years. So far this year, the number of daily riders is down by 550 from the year before. Casino workers living in western Atlantic County and Camden County, however, still rely on it, said Bob McDevitt, president of Unite Here Local 54, which represents 10,000 casino and hotel workers in Atlantic City. "I don't know how they can have a bus service as fast as a train," he said. "There's no way a local bus can get you from Lindenwold to Atlantic City in the same time a train can." A bus trip from Lindenwold to Atlantic City is nearly two hours long, according to NJ Transit schedules. A train trip between the two stops takes about an hour. NJ Transit is canceling the service to bolster its efforts to install positive train control, a federally mandated train-safety system, in time for a fast-approaching deadline. The Atlantic City Line's four locomotives and four cabs have to be retrofitted for PTC, said NJ Transit spokeswoman Nancy Snyder, which requires taking them out of service. The engineers of those trains will also have to be retrained to use the system and equipment will need to be installed on the tracks. The internal email from NJ Transit's senior director of systems operations, Richard Green, was also obtained by the Inquirer and Daily News. In it, Green wrote that equipment from the South Jersey route would be diverted to bolster NJ Transit service elsewhere. The shutdown is being done to speed PTC installation, Snyder said, and was not a case of South Jersey being poached to support busier routes in the northern part of the state. "We have to do what we have to do to ramp up the installation and train our employees," Snyder said. Crews from the Atlantic City Rail Line would be reassigned to other routes during the shutdown, she said. NJ Transit said also that its off-peak, one-seat rides on the Raritan Valley Line to Penn Station will also be suspended. Pulling vehicles and personnel out of service to install PTC wreaks havoc on scheduling, as SEPTA discovered during its now complete PTC installation process. NJ Transit attributed a high number of canceled trains Friday morning in part to PTC installation. Congress required passenger and freight railroads nationwide to install by the end of this year the safety system, which can automatically control a train's speed if an engineer doesn't. It's the system that experts said would have prevented an Amtrak derailment in Philadelphia in 2015 that killed eight. NJ Transit won't meet the end-of-the-year deadline, but a loophole would allow the agency to obtain an extension — if it meets certain benchmarks. If NJ Transit doesn't reach those benchmarks by the end of the year, it could face thousands of dollars in fines from the Federal Railroad Administration (FRA). The rail agency has already been given some breaks to help it qualify for an extension to 2020. It will only have to install PTC on half of its 440 train cars. Federal officials say that would meet requirements, but would create a shortage of equipment. The FRA also allowed NJ Transit to limit PTC testing to less than 17 miles of the Morristown Line by the end of the year, instead of its entire system. NJ Transit, which provides 62 million rail trips a year on 326 route miles, has PTC 52 percent complete, Kevin Corbett, the agency's chief executive, said in a statement. That's an improvement from 13 percent three months ago, but still puts enormous pressure on the rail agency with just five months left in the year. PTC installation has been a fraught process nationwide, with members of Congress and the FRA promising consequences for railroads that don't at least qualify for an extension. Only a handful of railroads will have PTC fully active by the end of the year, though SEPTA expects to be one of them. PTC is installed on all of its vehicles, and there is only about 40 miles on its network where PTC isn't fully able to recognize and control all the trains using that track, which can include Amtrak and freight trains. Those gaps should be closed by the end of the year, SEPTA said. Amtrak has PTC installed on all the track it owns on the Northeast Corridor, but it is reviewing whether it will adjust or even cancel service on tracks it uses but doesn't own that may not have PTC in place by the end of the year. 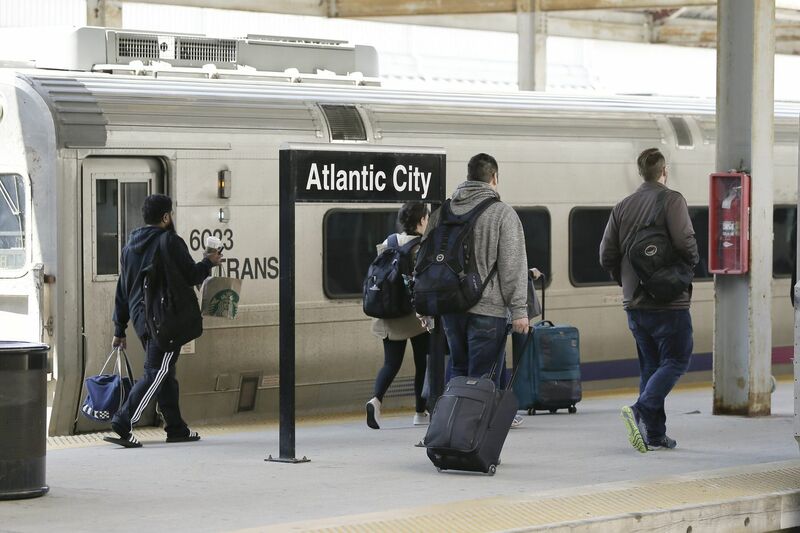 Getting to Atlantic City from Philadelphia won't be as convenient as hopping on a bus at 30th Street instead of a train during the service suspension. NJ Transit's only bus service to Atlantic City departs from 10th and Filbert Streets. A rider could also take PATCO to Lindenwold and catch a bus there. The train terminal in Atlantic City won't be used during the shutdown. Passengers will board at the bus terminal. NJ Transit will sell tickets to the Atlantic City Rail Line's nine destinations at a 25 percent discount from the usual price of a train ticket. Those will be accepted by NJ Transit bus Route 554; a shuttle bus that will operate between Cherry Hill, Pennsauken, and the Walter Rand Transportation Center in Camden; PATCO stops at Lindenwold, Walter Rand, and Eighth Street; and the River LINE. The 554 bus will offer service to all stops between Atlantic City and Lindenwold with a schedule that will mirror the standard train schedule, but will not be an express bus.